Yep, it's what you think it is. 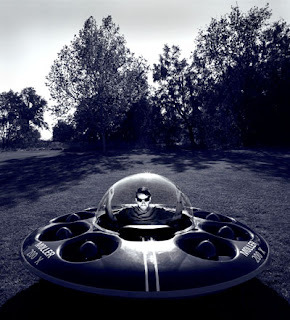 You're looking at a real flying saucer--and it can be yours for around $90,000. 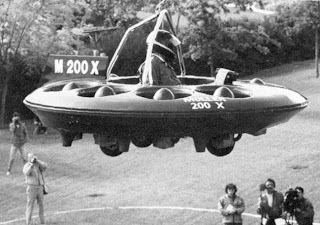 Made by a company called Moller International, this remarkable hovercraft can rise straight into the air and travel at 50 miles an hour. That's cool, Imagine secretly having one of those but having it much larger. Ha I can see my neighbor's faces right now when they come to my house with their eyes popping out of their heads... Ha that would be priceless... I better start saving up for a family sized flying saucer. I agree, they come out with a family size nd I'll use my collage savings to buy it (and probably go into a lot of debt..)! I'll get one when they come out with a model that can reach space! IT CAME IT CAME IT CAME IT CAME IT CAME!!!!!!!!!!!!!!!!!!!!!!!!!!!!!!!!!!!!!!!!!!!!!!!!!!!!!!!! words cannot explain the pure joy I am expierencing maybe thescreaming that just blew my mothers eardrums!!!!!!!!!!!!!!!!!!!!!!!!!!!!!!!!!!!!!!!!!!!! You have great hand writing by the way! Haha. Yeah, I judge people by their handwriting, too. Send me a note when you're done. And be sure to get some sleep! Japanese Battle of the Bugs!